Do you need to email a resume to apply for a job? What's the best way to do it? When you're sending an email resume, it's important to follow the employer's instructions on how to submit your job materials. For example, the employer may request that you upload or email a .pdf or .doc version of your resume and cover letter, if a cover letter is required. Make sure you follow the employer’s instructions carefully, or else you risk not getting your application considered for the job. 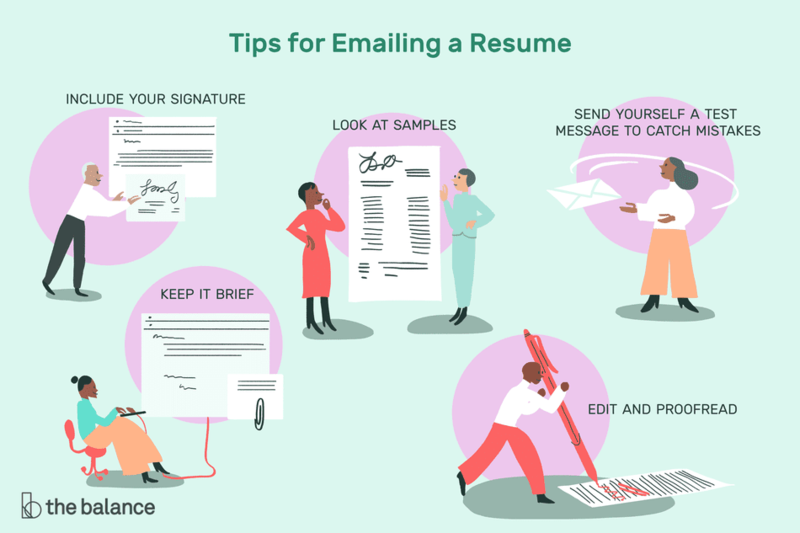 When there are no clear directions (and even when there are), follow these tips on how to submit your resume and other job materials by email. Follow the directions. The first rule of thumb when emailing a resume is to do exactly what the job listing says. If the listing asks you to send your resume in a particular format, or asks you to save your resume under a specific name, be sure to do so. Employers are less likely to consider job applications that do not follow submission instructions exactly. Send it as an attachment. Keep in mind that some employers do not accept attachments. In such cases, paste your resume into your email message as plain text. However, when there aren't instructions, the easiest way to send your resume is as an attachment. That will preserve your resume content and format. Your cover letter can either be attached as well, or written in the body of an email message. Choose a resume file format. Be sure to read the job listing carefully for any directions on what format the employer would prefer for your resume. If there are no directions, submit the resume as either a Microsoft Word document (.doc or .docx) or as a PDF. These are the formats most commonly preferred by employers. If you have saved your resume as a Google Doc or with word processing software other than Microsoft Word, convert your resume to a Word document. You should be able to click “File,” then "Download as" or “Save as,” and save it as a Word document. To save your document as a PDF, depending on your word processing software you may be able to select the menu “File,” then sub-menu “Save As,” and save it as a PDF. If not, there are free programs you can use to convert a file to a PDF. Don’t use a generic name like “Resume” or, even worse, “Resume1” or “Resume 2.” This might make the employer think you don’t care enough about the job to tailor your materials specifically for the position. It also doesn’t help the employer remember who you are. Keep it simple. Whether you paste your resume into the body of the email message or send it as an attachment, keep the font and style simple. Use an easy-to-read font and remove any fancy formatting. Don't use HTML. You don't know what email client the employer is using, so simple is best because the employer may not see a formatted message the same way you do. When applying for a job via email, you can copy and paste your cover letter into the email message or write your cover letter directly in the body of an email message. If the job posting doesn't specify how to send it, you can also choose to send your cover letter as an attachment. If you do so, use the same format as your resume (for example, if your resume is a PDF, your cover letter should be too). Also use the same naming convention as you did for your resume i.e., janedoecoverletter.doc. Be sure to read the directions on the job application carefully: sometimes companies want all your materials sent as one PDF or Word document, and other times they want separate attachments for each document. IIf you do send both your resume and letter as attachments, include a brief introduction in your email message. In it, state the job you are applying for and note that your resume and cover letter (and any other requested materials) are attached. Use a professional email address. Make sure to use a professional email address that includes your name or part of your name. If you don’t have one yet, create a new professional email address with your first and last name, if possible. Keep it brief. If you send all of your job materials as attachments, include a brief message in the body of the email that says who you are, why you are writing, and what materials you have attached. Include your signature. At the bottom of the email message include an email signature with your contact information, so it's easy for the hiring manager to get in touch with you. Look at samples. Look at sample emails with resumes attached and sample emails with resumes in the body of the message. These will give you a sense of how to format your messages. proofread your subject line, the body of your email, and any attachments. write your cover letter message in a word processing program, spell-and-grammar check it, and paste it into the email message. No matter how you write it, be sure not to rely solely on spell checkers, which can miss many grammar and spelling mistakes. Reread your message yourself, and consider having a friend look at it as well. Send an email test message. Before you click “Send,” send yourself a test email message to be sure your application is perfect and good to go. Attach your resume, then send the message to yourself first to test that the formatting works. Open the attachment so you are sure you attached the right file in the right format, and that it opens correctly. If everything is set, send it to the employer. If not, update your materials and send another test message to yourself.